Thanks to our friends at Sheldon, and all those whose kindnesses made the Kindness Quilts possible. 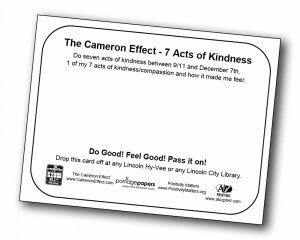 To share how you’re spreading The Cameron Effect, and how those actions make you feel, click on the Personal Experiences Blog link, or if you are in Lincoln, fill out a Kindness Card. They can be picked up and returned at any Lincoln City Library or any Lincoln Hy-Vee Grocery Storyor at First Plymouth Church (20th & D Street) starting 9/11/2012. They will be made into Kindness Quilts by volunteers and displayed at Hy-Vee, 84th & Holdrege (where Cameron had worked) or at Sheldon Memorial Gallery of Art! Mom, I think I know what hell is. People make their own Hell right here on earth—like when they are mean to someone and it makes them feel bad inside, that’s their hell…And heaven is in the other way. When you do something nice, you feel so good. You make up your own heaven, right in your own head. 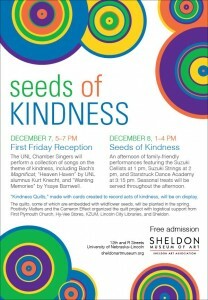 The UNL Chamber Singers will perform a collection of songs on the theme of kindness, including Bach’s Magnificat, “Heaven Haven” by UNL alumnus Kurt Knecht, and “Wanting Memories” by Ysaye Barnwell. An afternoon of family-friendly performances feagureing the Suzuki Cellists at 1pm, Suzuki Strings at 2pm, and Starstuck Dance Academy at 3:15 pm. Seasonal treats will be served throughout the afternoon. “Kindness Quilts,” made with cards created to record acts of kindness will be on display. The quilts, some of which are embedded with wildflower seeds, will be planted in the spring. Positivity Matters and the Cameron Effect organized the quilt project with logistical support from Frist Plymouth Church, Hy-Vee Stores, KZUM, Lincoln City Libraries, and Sheldon. We had a kickoff on Sept 11, with a presentation by Detective Jay Armbrister, from Lawrence Kansas. Det Armbrister investigated the crash that killed Cameron Freeman and injured his three friends on Nov. 23, 2010. This presentation pieces together the stories of the lives of both Cameron and the drunk driver, Zachary Harrison—both good young men with promising futures. And how one really bad decision of getting behind the wheel when drunk shattered the lives of both, and of so many others. We hope this story will help us all learn about having a plan before we drink so we can prevent this tragic story from happening again. Shelley Freeman then explained how the movement got its start with a call to NOT go down the road of anger, but instead choose compassion. Nick Hernandez, of Positivity Matters explained what the Cameron Effect – 7 Acts of Kindess season is about this year. Jay Armbrister will be there to answer questions as well. Paul and Shelley presented The Cameron Effect and Forgiveness to the Youth Group at First Plymouth Congregational Church on September 26. This group consists of about 75 young people from grades 6 through 12 who requested to participate in the Cameron Effect. They have started their own Kindness Quilt on the wall of their Youth Room. The video of that is in production. 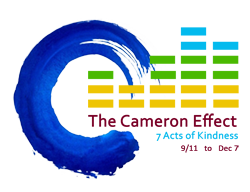 The Cameron Effect – 7 Acts of Kindness will launch this year on 9/11 a day known for its violence and destruction, and end on Cameron’s birthday, December 7, also known as Pearl Harbor day, another day of destruction. Let this season be transformed to one of kindness, compassion, and forgiveness. And we hope the Cameron Effect will continue to inspire people to do good every day of the year. Share: Very Important part. If you are in Lincoln, pick up and drop off Kindness Cards from any Lincoln City Library or Lincoln Hy-Vee Grocery store or First Plymouth Church, 20th & D Street—Or you can print your own.